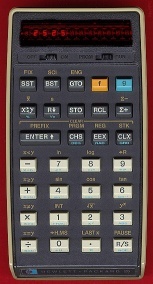 I found a very nice Java simulation of the Hewlett-Packard HP25 calculator at the online Museum of HP Calculators. I decided try porting it to the BlackBerry Storm. I had one of these calculators back in college, and I currently own a Storm, so it seemed like a fun thing to try. Here is the version of 1.1 Beta3 that you can download directly to your Storm. Here is the original version of the program (version 1.0), which you can download directly to your Storm. Here is the Java source code for version 1.0, which can be built with RIM's Java Development Environment for BB OS version 4.7. Here is the final source code for Beta version 1.1. On this page is the original version, written as a Java Web applet by Larry Leinweber. To port it to the Storm, I kept Larry's calculator engine code and nice photo-realistic graphics, and rewrote the user interface to work with the Storm's touch screen. I also added a second screen layout, which you can select in place of the photo-realistic layout. Bruce Reidenbach has taken this program and added some nice new features, including much nicer graphics. Go have a look at his version!